Update: The recipe for Homemade Yogurt in the Crockpot is here. 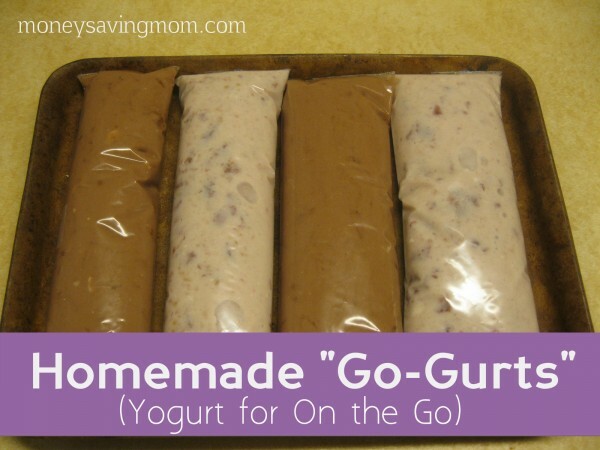 My kids barely know what a Go-Gurt is, but since I’ve been making yogurt by the crockpot full, I thought making homemade yogurt tubes would be a fun way to eat it up as well as travel with. First, I made a batch of yogurt in my crockpot (I add in 3/4 cup powdered milk to the initial milk to improve the consistency). Milk in my area is about $3/gallon and I usually use a half-gallon, so between the milk and the two other ingredients I used (3/4 cup powdered milk and ½ cup yogurt), I estimate it costs me about $2 for a half gallon of yogurt. Then, I put ½ cup of the flavored yogurt in a SNACK-size baggie and squeezed out the air. I folded it over and secured it with tape. After laying them down flat on a cookie sheet (shown is a mini bar pan), I put them in the freezer. When they were frozen, I cut off the end with some scissors and my kids (and I) did a happy dance. I made 22 “go-gurts” from the batch of yogurt and they came out to be about $.09/piece. You can also make homemade popsicles with these ingredients, but in the baggies, they were basically spill-proof and easy to travel with—which is what I was hoping for! Angie is a homeschooling mom of four, a lover of the Lord, coffee, books (including Quickbooks), and all things frugal and DIY. Wow, I’d love to have the directions/recipe for the homemade yogurt! I made homemade yogurt only one time and it was delicious. I’ve been meaning to do it again for awhile and just never seem to get to it with 4 kids running around, but this is the link to the recipe I followed and it was great!! Enjoy! The crockpot 365 blog has an easy crockpot recipe for yogurt. Here’s a link to my recipe for crockpot yogurt. It really is delicious. What a great idea! Now I can have “go-gurts” available for my dairy allergic child using homemade coconut yogurt. Thanks for posting! I too have an eight year old allergic to dairy. He loves the soy yogurts but they are so expensive. Would you mind sharing your idea about the coconut yogurt and any other dairy free recipes? Thanks so much! What Melissa said… but I would add that you thicken it w/o using gelatin or any other thickeners simply by refrigerating the finished yogurt. It should separate with lots of liquid at the bottom. Carefully pour out the liquid, then strain the remaining yogurt much like you would Greek yogurt. It becomes very much like the consistency of “real” yogurt, even close to Greek yogurt. Love this idea! Just wondering, could you share the recipe for making yogurt in your crock pot? I have never heard of that before! Thanks! I have been making yogurt in the crockpot for awhile now. It is wonderful. We haven’t bought the store kind for a long time. I got the recipe off http://crockpot365.blogspot.com/. Love this idea! Could you share the recipe for the yogurt “base”? Thanks! Would love to try this, can you share the yogurt reciepe? Pretty please. Would you also share your recipe for the yogurt?? I have wanted to try my hand at homemade yogurt for a while now. Excellent. : ) Do you have a link to your homemade yogurt recipe? My hsuband eats it every day. I wonder if I could use lactose free milk to make these? They look great I like others would love to have the recipe for homemade yogurt. Thanks for this great idea. I love this! I’m confused on how to make the yogurt in the crock pot though. I’ve never done that. Is there a link for that recipe? Love this! What is your recipe for yogurt in the crockpot? Thanks Stephanie! I can’t wait to try making it! This looks great. I too, would love the recipe for crock pot yogurt! Thanks for a great idea! Please share how you make yogurt in the crockpot! Brilliant! Mind sharing how you make the yogurt in the crock pot? Thanks! Awesome! I was going to try making yogurt for the first time this week, but I’d never heard of doing it in the crockpot! That seems way easier! GREAT idea! Can you also give us the recipe for how you make the yogurt? I would love to give this a try! Yes, I would like the recipe for the yogurt, like why do you need yogurt as an ingredient when you’re making yogurt? How long do you keep it in the crock pot? I’m intrigued!! We buy a lot of yogurt here at our house, so this could be quite the money-saver for us. Can you post how to make the yogurt in the crockpot? Is there any way to make it vanilla without using pudding mix? (vanilla flavoring and sugar? maybe?) Thanks! This sounds like a fun project. Please provide the recipe/directions for the crockpot yogurt. So what is the exact recipe you use to make the yogurt in the crockpot? This sounds so yummy, thanks! id love the recipe/steps for making yogurt in the crockpot! I just clicked on the underlined part that said “batch of yogurt in my crockpot” in her second paragraph and it took me to the recipe and tips, etc. 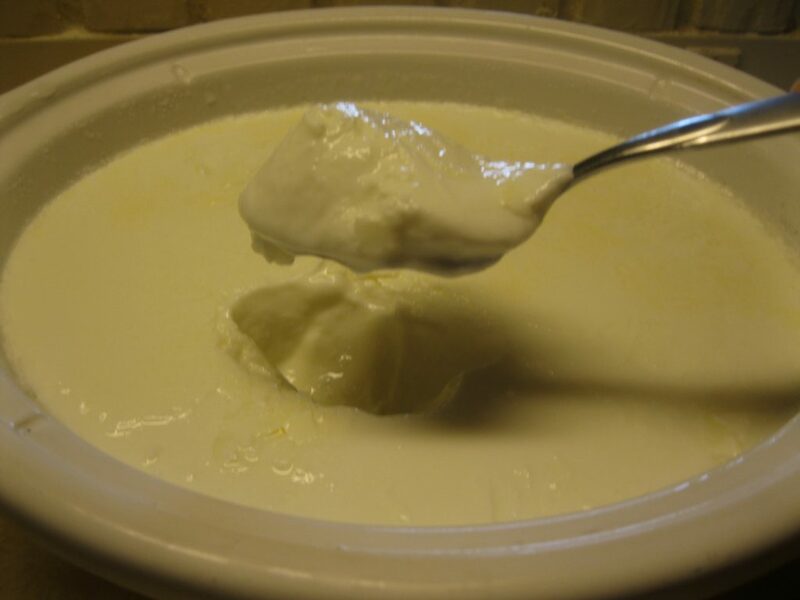 I have had success and failure with crock pot yogurt recipes… whats your recipe? I use this recipe for making yogurt in the crockpot. Very easy! I think I’m with everyone else here….Can you please the crock-pot yogurt recipe? Pretty, pretty please…with a cherry on top?! FANTASTIC! How do you make th yogurt. I need step by steps cause I have to try it. What a great idea. I haven’t tried this yet, but for those of you looking for the recipe, I googled “Crockpot Yogurt” and came up with a bazillion (yes, that’s a technical term 🙂 results! They all looked pretty easy and only varied slightly in their approach. I’ve seen the Gogurt commercials that suggest freezing the product before placing it in a lunch bag – but I’ve always wondered what that does to the live active cultures in it? I suppose the calcium content wouldn’t change, but if I’m only looking for a calcium boost we just do milk – if we’re doing yogurt it’s because we’re looking for those live cultures… does anyone know anything more about this? I have heard that the live active cultures in yogurt are no longer “live” after you freeze yogurt. In regards to the live cultures, freezing does kill them:o( bummer., So yogurt is best in that aspect when you don’t freeze it. I don’t like to freeze it because of that, but on the rare occasion we buy go-gurts, my kids like them frozen. They mostly just eat yogurt cold from the fridge. I don’t want them liking it only frozen because I want them to get those live cultures, too. I think that this recipe is a great alternative, though-healthy and as natural as it can be-especially instead of a “popsicle”, which we don’t ever have here from the store, at least. I think that this would be a good way to get a protein filled dessert in the kids, though. Well, freexing definitely doesn’t kill all of the live cultures. I freeze yogurt bought in large tubs in smaller portions so that I can later use as my starter yogurt for the my homemade yogurt. I don’t think the yogurt would set if the cultures were all dead! Don’t forget the fun factor, either. I don’t want my kids to feel like they never get what the other kids are having. You need to research the “live active culture” thing. It is my understanding that heat is what will kill them, not freezing. When temperature is brought back up (like in your gut where you want them), they become active again. I’ve been making smoothies with my homemade yogurt for about 6 months and freezing any leftovers into cups that the kids enjoy as a snack—almost like ice cream! This is what I thought too – that freezing puts them in a dormant state and they become “live” again upon reheating. Lauralli is right- freezing doesn’t kill them. Many people buy a big tub of plain yogurt and freeze in ice cube trays to use as their starter for the next batch. If you killed them, you wouldn’t have anything to feed off the lactose in the milk and wouldn’t end up making yogurt. From what I understand freezing does NOT destroy live active cultures. If you purchase a yogurt starter culture it has been freeze dried. Heat does kill it though. So when you see baking/cooking recipes that use yogurt remember that the cultres become useless. Great idea! I had seen the “go go squeeze applesauce” and was wondering about how to make those at home. This is a great way! I’d love to have her crockpot yogurt recipe…. Great idea! I’ve also seen homemade go-gurts made using a food saver vac. Even buying big giant tubs of vanilla yogurt and dividing it up is cheaper than the individual cups or commercially prepared go-gurts. This sounds like a great idea! I’ve been giving frozen Go-Gurts to my daughter as a semi-healthy dessert recently! Could you post the recipe for making the actual yogurt in the crockpot? Thanks! Awesome! I was just thinking of ways we could cut down our yogurt budget. 4 people eating it once a day gets expensive! can we get the recipe to make the yogurt? She has the ingredients listed and does say in a crockpot but how long and at what temp in the crockpot? The recipe is now linked in the post. I have some popsicle molds that push up like a go-gurt would, but the snack bag idea is perfect for the times when I have more yogurt or smoothies than will fit in my molds. Thanks! I got some great silicone molds on amazon that we use for frozen go-gurt type treats which are great for lunches. I never even thought to use snack baggies what a great idea! I didn’t have much luck with the fresh fruit b/c it seems to thin the yogurt too much when blended. If I happen to have a batch that flops (too runny), then I use it in smoothies, pancakes, thin for buttermilk, sour cream in some recipies, or freeze in batches for when the need arises. I also freeze the “starter” yogurt in ice cube trays. I take out 4 cubes (1/2 cup) and let it thaw to use as my starter. Don’t be discouraged if it doesn’t work right away. I wasn’t impressed with my first batch, but with all the other uses for it + 4 hungry kids, it doesn’t go to waste! I still have some batches that are runnier, but most of the time, they rock! Did you find a trick to make it so that it is not runny? That was why I stopped making it at home! I think it depends on the cooking time as well as the creaminess of the milk. If I undercook, it is runny. One time, I didn’t get the crockpot shut off in time and it was much firmer (but a little lumpy). I add powdered milk or 1/2 and 1/2 and usually get good results. You also have to put it in the fridge the next day before it sets up. I tried this with food saver bags, but it sounds so much easier with snack sized baggies. Thanks! I made applesauce tubes this way too. That was a big hit with DS. Do you freeze the applesauce bags? What is the texture like? No, I just kept them in the fridge. Awesome idea – thanks for sharing! Thanks so much for sharing…a simple, yet brilliant, idea! I see where this is very economical, but is this yogurt healthy? Are there enough live active cultures present to make this yogurt comparable to what is available commercially? Making the yogurt yourself is healthier. More cultures aren’t added to regular store bought yogurt, just more junk. Kelly—This is much healthier than store bought yogurt! You do need to start out with yogurt or yogurt starter as a base, then the “live active cultures” multiply in your milk to “make yogurt”. I only use 1/2 gallon of milk, one 6 oz. 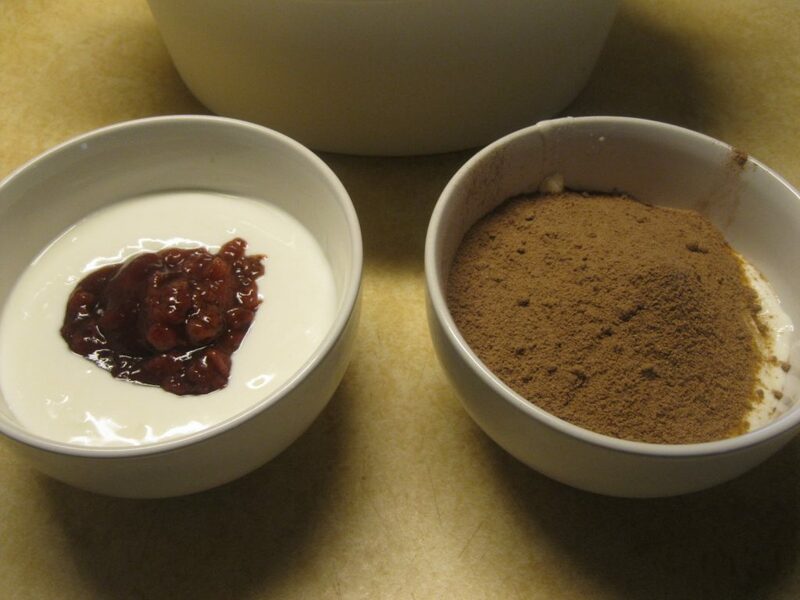 container of plain yogurt, 1 tsp. kosher salt, 1 tsp. vanilla and 2 Tbsp. sugar and I get 11 6-8 oz. containers of yogurt. You can then add any flavors or fruit you like. Try reading the label on the store bought yogurts to see what all they add! Your tummy will thank you! Awesome! I didn’t know how rapidly the cultures multiplied so wasn’t sure how many you’d get with such a small starter and such a large amount of final product. So… the recipe says NOT to use ultra-pasteurized milk, which all organic milk in my area is ultra-pasteurized. Is there a way to make this with organic milk? Obviously, it won’t be as cost-effective, but I try to feed my kids organic dairy and I don’t want to waste 1/2 gallon of milk (at nearly $4!) if it won’t work. I tried it with Horizon organic milk and it curdled. I threw it out. I know this is probably much cheaper than store bought go-gurts, but I would not say it is healthier. These still have lots of sugar from both the pudding mix or jam and the added sugar. Not only that, but the pudding mix has artificial coloring and flavoring. And powdered milk has oxidized cholesterol which is not healthy either. I don’t want to be a downer but I don’t think this recipe is healthier. Hey, that is why you go to the health food store and pick up pudding mix and jams from them. All natural and often organic ingridients and still great addition to homemade treats! Wow! This is brilliant. I can’t wait to try this! I’m constantly amazed and thankful for all the creative ways we can make things at home cheaper and better for you than commercial food! Um….this is GENUIS! One of my must make things for November is yogurt in my crockpot. Thanks so much for sharing this. I do like the idea of the disposable ones too..so you can make more than 4 at a time…but these would be good for lunch boxes too. I used to LOVE Go-Gurts but they were too expensive so we only got them for special occasions. I just might make some of these for myself this week! I’ve been doing crock pot yogurt for a while posted here, http://momonamission.me/?p=2066, It’s really, really easy and I don’t take the temperature and yada yada, my three-year-old helps. I use vanilla pudding as a thickener sometimes. It flavors the yogurt which my tween daughter likes. 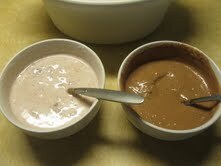 I add all fruit jam and vegetable puree to make homemade Yo baby meals for our baby. I’ve been wanting to make homemade gogurts for a while; this inspired me! Thanks for posting. The yogurt looks so yummy, great job! I never have had much success in freezing homemade yogurt, though. It always tasted grainy to me. 🙂 But it sounds like you found a way that it works for you, so way to go! Great post!! I am going to try this over the weekend. This is why I love your website. I had no idea I could make yogurt in a crockpot! I’m going to try this soon. My kids eat yogurt like mad. I followed the links and eventually ended up at a dairy free yogurt recipe which will work great for my lactose intolerant family. I can’t wait to try the apple butter in a crockpot recipe as well. Thanks for all of the great ideas! I’ve been making yogurt for my family for about 6 months now, but I use our yogurt maker. I’ll definitely have to try the crock pot method! Superb! Wonderful! Can’t wait to try the go-gurts. But I am really, really excited about the slow cooker yogurt recipe. I have 2 yogurt makers that are just too fussy to bother with, but I love my slow cooker. The go-gurt popsicles look delicious and easy to make. Not to mention inexpensive. Lovin’ this idea! Can’t wait to give it a try. I know when I make yogurt in the crock pot it only last about a week. When you freeze it like go-gurt how long will it last? Thanks! Just thought I would let everyone know that Amazon has reuseable push up containers that are great for making homemade go-gurts. They are called Norpro Silicone Ice Pop Set. They are around $10 for a set of 4, but they get great reviews and my family loves them. See the comments above on this and why freezing doesn’t kill the live bacteria. I hope that helps! That is very helpful to know. Thank you! THERE IS ONE!!!! Go to “From My Kitchen” in the brown bar at the top. In the drop down menu there is a “Recipes” tab with all the recipes I have been looking for!!!! Could you flavor them with small boxes of jello? Or would that mess up the consistency? My kids really like the crazy flavors – cotton candy, blue raspberry, etc. I don’t think the jello would mess up the consistency. The biggest issue may be getting the flavor right b/c it will have that yogurt “tang” to it. Anything fruity should work, though. I JUST made my first batch of homemade yogurt last night (followed the recipe exactly and took the advice of adding 3/4 cup powdered milk), I let it sit in the fridge over night (definitely helped the consistency, firmed it up more). 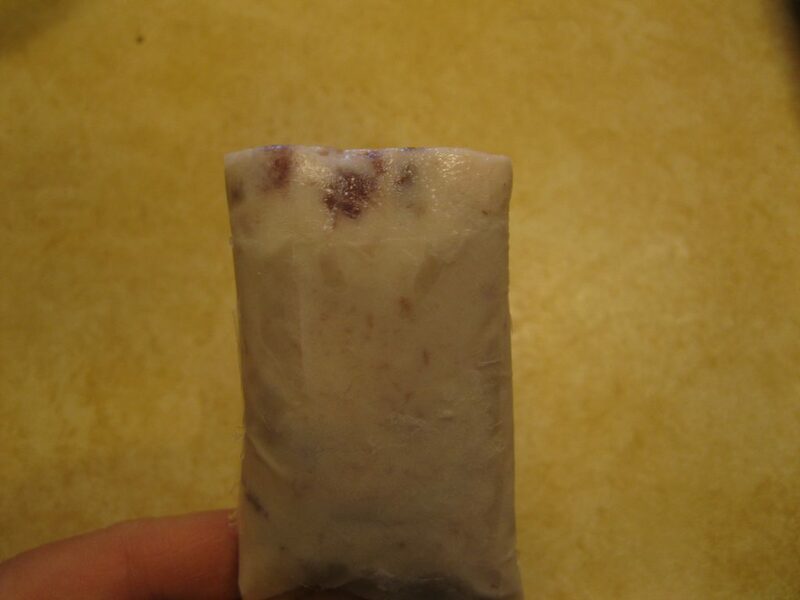 I added some frozen blueberrries and a little sugar to it today, made about 20 “go-gurts” and put a 1/2 cup of the plain in the freezer for the next batch. Now all I need to buy for the next batch is a 1/2 gallon of milk. I LOVE this idea! So much healthier than store bought yogurt, and it couldn’t be any easier. And I’ll second the happy dance! We haven’t gotten to try them frozen yet (I just put them in the freezer about 20 minutes ago) but as I was making it my 15 month old got antsy, so I gave him a little bowl to try, which turned into seconds, thirds, and forths, he couldn’t stop eating it! Amazing!! Thank you so much this is awesome. I’ve really learned so much from this site! LOVE it!!! !